The best summer in recent years. That is the expectation of the State Secretariat of Tourism for the holiday season that is coming. That means hotels and inns with average occupancy exceeding 85% and a movement of money “democratic” it benefits the seller of acaraje and coconut to taxi drivers, pubs and restaurants. The Assistant Secretary of Tourism of Alagoas, Danielle Novis, attributes the fact – well, of course, the natural appeal that marks Alagoas tourism for decades – to a repositioning of the state on the national scene. “The Government pointed to tourism as a major economic axis and has handled the industry with professionalism. This has borne good fruit, “he says. As evidence of good fruit, the assistant secretary shows numbers unquestionable. The high season should have around 150 000 tourists in hotels only Alagoas, against 120 000 last summer. At sea, the news is also good. One hundred and twenty thousand tourists must pass through the state in 58 cruises planned for the period, up from 75,000 last season. Added to this the 180 000 passengers on regular flights and charters more than 50 000 of which come from Italy and Chile. “If we include tourists who come by land, since the regional market represents a large portion of our users, we can say that the station will be very good,” celebrates Novis. And to get so many people, the tourist infrastructure gained acceptance in recent years, the state saw the emergence of new hotels – some large – as Miramar (Maragogi), Keno (Barra de São Miguel) Salinas Maceio (Ipioca) Brisa Tower (Jatiúca) and Radisson (Pajucara). And do not stop there. The projects in construction and design point to a considerable growth in the number of beds. According to Setur, the state will jump from 14 000 to more than 20 000 beds within two years. Suites hotels like the Ritz, which is being erected on the beach in Cruz das Almas, will contribute over 336 beds in the second half of next year. There are also new designs for the northern and southern regions of the state. “The Virginio (Loureiro, sec. Estadual de Turismo) always says that the big difference today is the presence of the state, prioritizing the sector. That is credibility operators, agents and entrepreneurs in the industry, “Novis said. “In many of these developments, Setur took the hand of a businessman and tried to solve problems with Ceal, Young, Ima (Environment Institute), among other organs.” She recalls that when he took the folder, in 2007, there was a hostel which was not built for lack of just two letters. Danielle Novis, this resumption of tourism brings a basic sense for alagoano: the rescue of self-esteem. She said Alagoas like to see the town being admired by visitors. Besides, who first benefits from improving the infrastructure of the town is the neighbor, “he says. Danielle told Novis TNH a fact that few know. The reorganization of Pajuçara – which extends to Jacarecica – entered the list of PAC works after a work championed by Setur, which brought together some 60 agencies and entities. In 2007, the group visited various parts of the border to target the most critical areas. Recently, Setur met with the Federal Police, Infraero and the IRS. The goal: make life easier for foreign tourists arriving in Alagoas International Airport Zumbi dos Palmares. 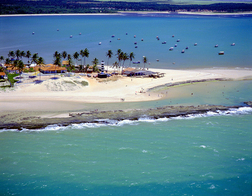 Alagoas last year received 1.8 million tourists. On average, each turns out here 250 dollars per day. Do the calculation and see how it contributes to the state’s economy. And it never hurts to remember. This money goes to the agency and from the hotel, but the waiter arrives, the craftsman and the traveling. It is an expense of democracy, with great social importance.